Forty youths have been abducted in Borno State by Boko Haram insurgents who resorted to deceit to trap their victims. And the abduction was effected in the presence of many parents who watched helplessly as their children were taken away by the armed men. 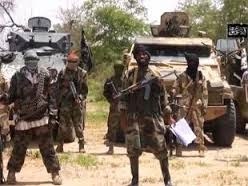 The insurgents had stormed Malari village in Damboa Local Government area on Wednesday night and called out residents to come to the frontage of the village head and listen to their preaching. But once the people had gathered, the armed men began picking the young men one after the other. A resident, Maisaje Abdullahi,61, said three of his sons and two of his nephews were taken away by the invaders. “They gathered us in front of the village head`s house for preaching after which they took away over 40 of our boys between the ages of 10 and 23 years heading towards Sambisa forest. They did not touch a single married man,” he said. Malari village is about 20 kilometres from Sambisa forest. Witness Mohammed Zarami said the gunmen arrived at the village of Malari at about 8 p.m. on Wednesday, heavily armed but did not fire shots or kill anyone. “People ran out of their houses in fear but they warned that no one should disobey them,” Zarami said in the state capital, Maiduguri, where he had fled to on foot. The attack on Malari has triggered panic in surrounding villages forcing residents to flee. Lawan Adamu, a resident of Mulgwai, is one of those on the run. He said Boko Haram insurgents regularly visit the village to preach and with what has happened at Malari, many villagers have learnt their lesson. “Now most of our people are fleeing the village, because they come regularly to the village to preach and leave but with the recent abduction we are afraid they may come back to abduct our children or even burn the village and kill us,” Adamu said. Efforts to get the Borno State Police Command Public Relations Officer, DSP Gideon Jibrin, for confirmation proved abortive, as his telephone lines were not going through. Over 200 schoolgirls abducted from Chibok in the same state last April by the sect are yet to be found. Parents of the girls said they are now taking the case to the United Nations for possible assistance having lost confidence in the ability of the federal government to rescue their children.